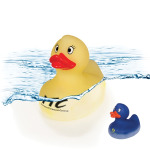 Make a splash and have some fun at your next promotional event with this color changing rubber duck! This unique novelty item is made of PVC rubber and changes color when the water temperature reaches 38 degrees C / 100 degrees F. It starts out with the color and changes to white at the proper temperature. With an imprint of your marketing slogan or logo, this item will make a great giveaway at a variety of events! Please note: the ducks are not weighted. Size: 3.125" x 3.75" x 4". I'm interested in learning about the Color Changing Rubber Duck. Please contact me.